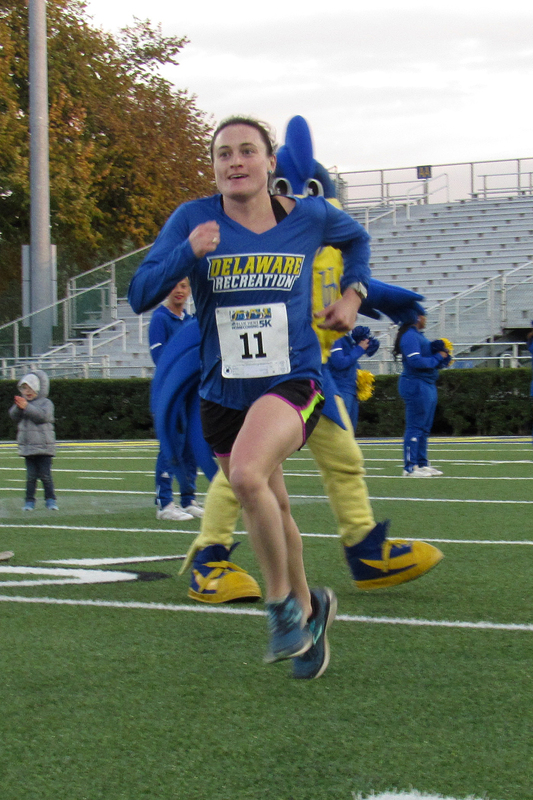 The photo may look like she has sprouted wings and an extra pair of legs, but it is just CRR Jo Baird’s strong and determined finishing kick, as YoUDee—the University of Delaware mascot—peers over her shoulder while she finishes the UD Homecoming 5K last Wednesday. Baird was the second overall finisher and top woman, crossing the line in 18:44. CRR Bruce Weber trailed Baird by just seven seconds, clocking a 18:51 in third place as the top master’s runner. CRR Bill Rose finished 13th overall and took third in the 50-59 age group with a 20:32. 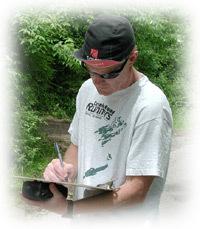 CRR Doug Repetti took second place among the 65-69s in 25:21. CRR Anja Leefeldt took first in the 40-49 age group in 25:29, less than three seconds off the finishing time of the woman who took the top master’s place. (Leefeldt’s chip time was actually three seconds faster than the top master’s chip time, meaning she’ll have to get closer to the starting line in the future.) CRR Becky George took third in the 50-59 age group in 26:34. Great results for Baird, who was training for the Marine Corps Marathon, and for many of the other Creek Road Runner women at this race. CRR Christine Schultz even raced in her UD-colored Homecoming tutu! Organizer and CRR Mark Deshon is having some cause for concern that the current course is too difficult to follow, something he’d never really given much credence to before today. What with many opting to cut the loop course short for one reason or another and several “newbies” participating each year, we may need to come up with a fool-proof system for ensuring the integrity of the “Wring Out the Old, Ring in the New” trail run. The purpose was achieved, however—that is, to have fun! Sporting the course map shirts, CRR Mike Shay (left) listens as Deshon gives some pre-event tips—like don’t get lost. The Newark Morning Rotary Rock & Roll 5K was a fantasy of sorts—a unique opportunity to run on the cushy, well-manicured grass of the Newark Country Club’s golf course on Saturday. It was a no-frills event but a fun time, nevertheless, with the popular local band Club Phred playing before, during, and after the race. 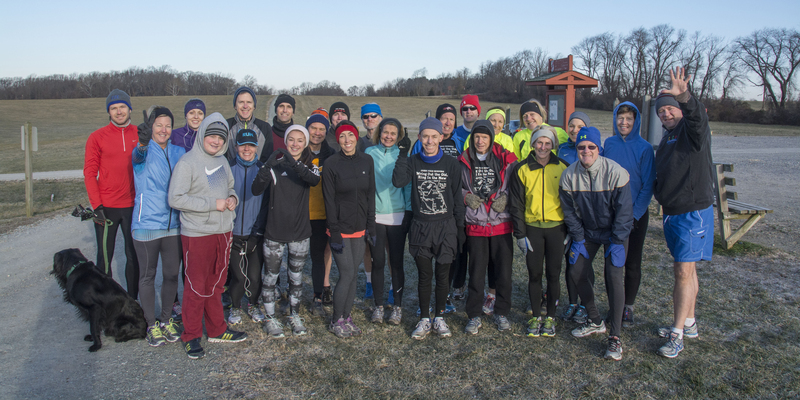 A few Creek Road Runners excelled. Taking age-group firsts were CRR Bill Rose and CRR Becky George, who each won the 50-59s. Rose must have really enjoyed the surface, as evidenced by his 19:15 time (fourth place overall). George’s time was 25:27. CRR Bob Taggart (60+) and CRR Mary Braun (50-59) took age-group seconds, Taggart coming in with a 26:09 and Braun not too far behind in 26:36. An honorable mention of sorts goes to husband and wife CRR Dave Schultz (23:06) and CRR Christine Schultz (24:58), who each placed third in the 40-49 age group. It was a true family affair for the Schultzes, with daughter Lawson taking second and son Ben taking third among the 13-and-unders.